Today, low-cost / low-power / Internet-capable hardware platforms are making possible “small-batch” hardware devices capable of controlling software. And as with the first graphical user interface, there’s an opportunity to reconsider what a “button” could mean in a new control scheme. When any physical object can be used as a control, what can a button be made out of? How could it be triggered, and how might we incorporate the button’s physical environment? One straightforward idea is to take visual symbols that already exist in software and recreate them in hardware. For instance, Breakfast NY created a real-world control for Pandora Radio’s feedback buttons. A different approach – and one that I thought would make for an interesting hack – is to imagine what a “thematic” button could look like. 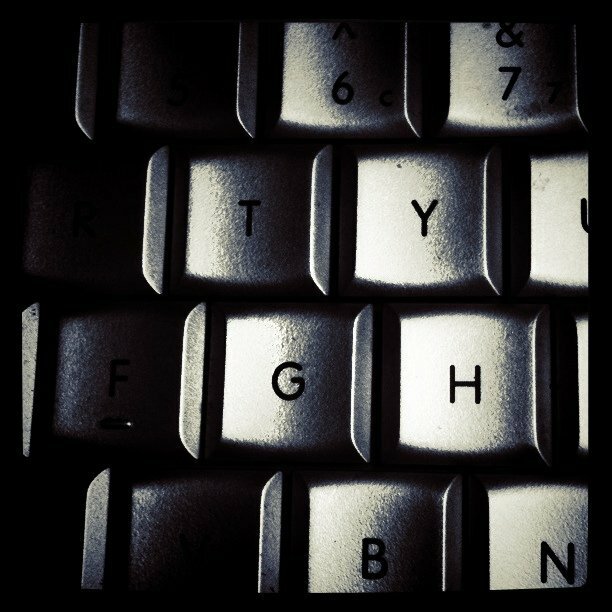 Rather than aping visual cues, a thematic button could reinforce the purpose of the software, and be designed for the environment in which it would live. I decided to make a thematic button for the communal music app we use at The Echo Nest, nicknamed “Prosecco” (after the Italian sparkling wine) and written by @nedjl. 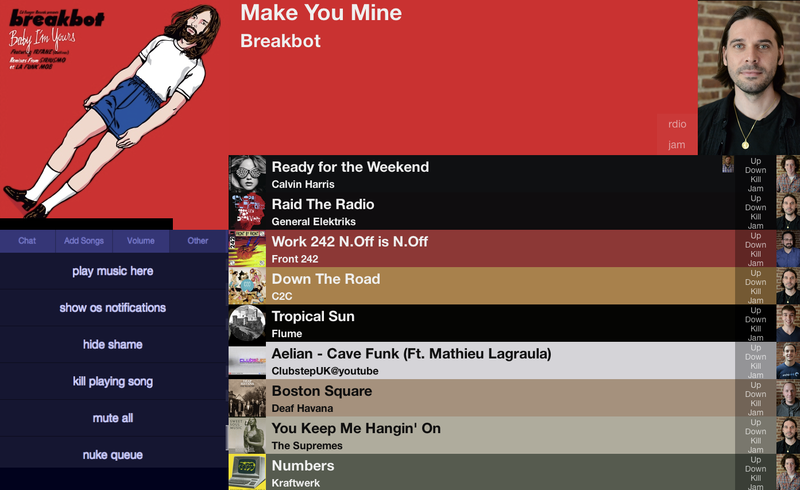 Prosecco is a web app that lets employee submit music to a queue; the songs stream simultaneously to our Boston headquarters, our San Francisco office, and anyone logged while working remotely. The app also shows who submitted each song and has several ways to provide feedback, such as “jamming” the current song if you like what’s playing. Prosecco is communal. Prosecco requires accountability, as no anonymous submissions are allowed. Prosecco encourages open feedback. So what might a thematic button for Prosecco look like? Sketching out the components of a thematic button for the Prosecco music player. Given those themes and the nickname of the app, the “button” I came up with was a wine bottle capable of communicating with Prosecco. The bottle should live in the kitchen, the most communal area of our office. People would be able to see what song is playing on Prosecco and who submitted it. And if someone likes the song, gently tapping the bottle on the table would trigger a “jam” within Prosecco. 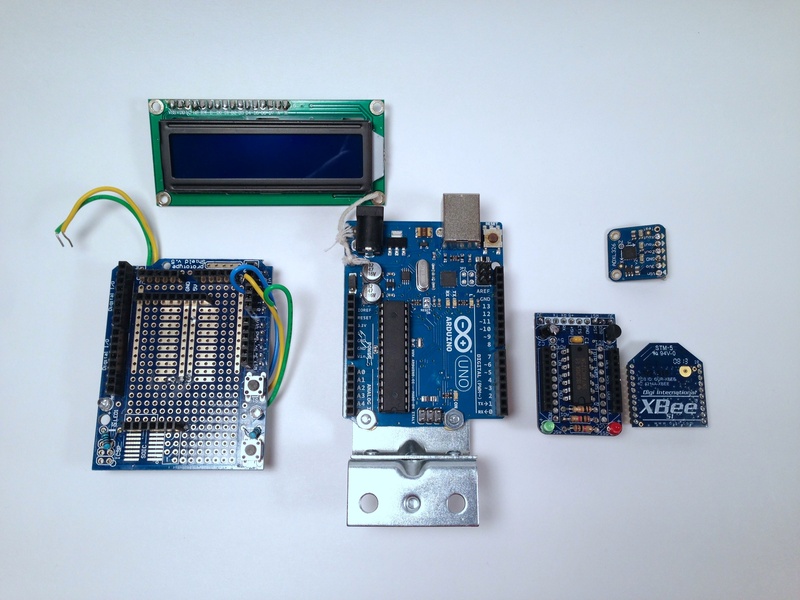 The basic components were an Arduino Uno, a 16×2 LCD screen, two Series 1 XBees each mounted on an Adafruit XBee adapter kit, a 16g accelerometer, a pair of bright LEDs (blue and white) for feedback, and a prototyping shield. Communication between Prosecco and the wine bottle is done via the XBees. One XBee is plugged into a laptop running a Python script that regularly polls Prosecco for the currently-playing song and the person that submitted it. 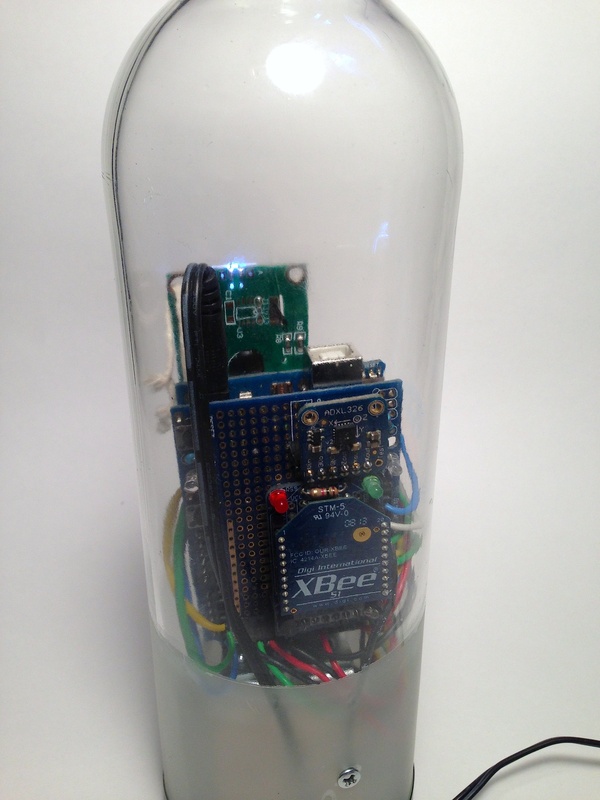 The other XBee is in the wine bottle, wired to the Arduino and LCD screen. The laptop XBee transmits information on the currently-playing song, artist, and submitter to the bottle, where it is displayed on the screen. 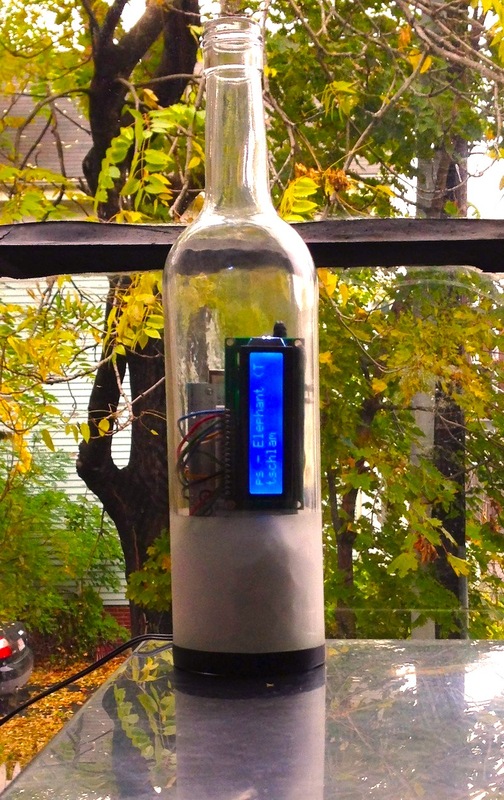 The accelerometer feeds into the analog input pins of the Arduino and waits for swift, sudden changes along any axis of acceleration – such as the shock produced by the bottle being lifted and then tapped against a table. 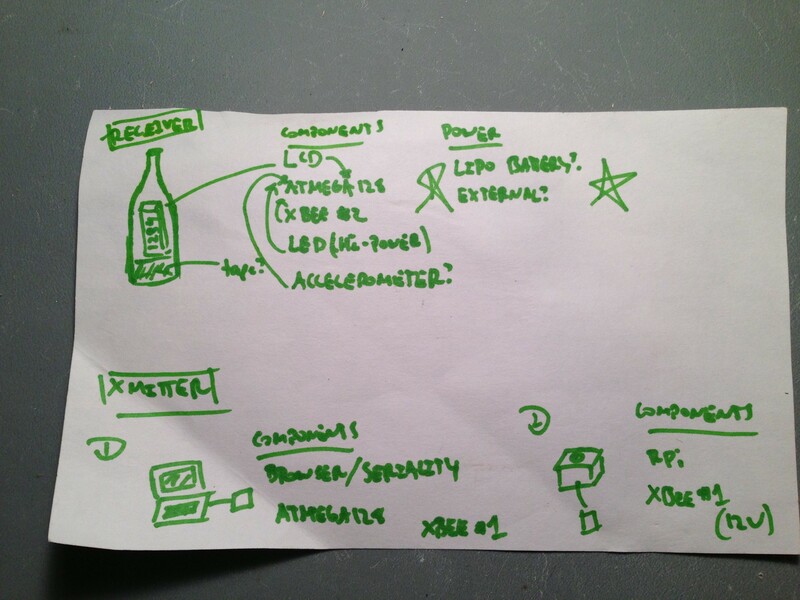 When triggered, the bottle XBee transmits a “jam” request back to the laptop XBee, which executes the request via the Prosecco API. I wanted to easily be able to reuse, replace, or cannibalize parts for future projects, so I sought to make this project as plug-in / pull-out as possible. 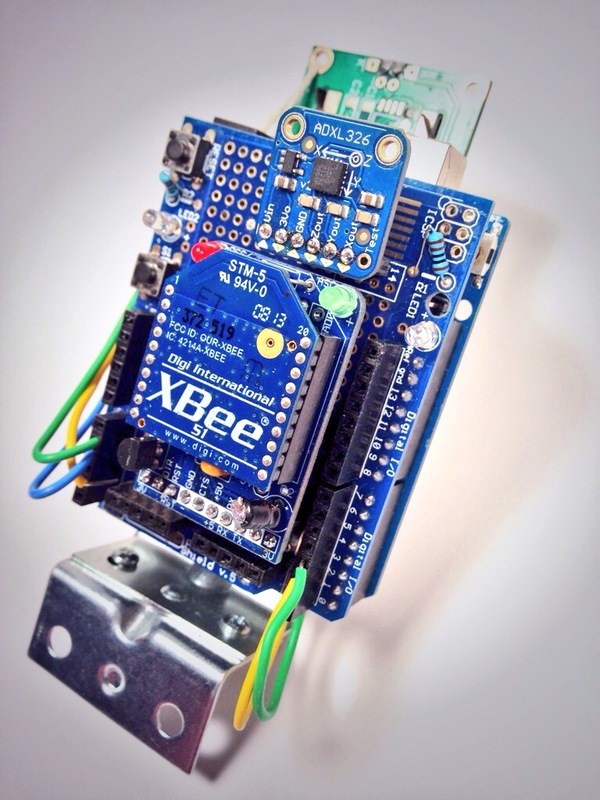 The XBee and accelerometer are plugged into female headers soldered onto the prototyping shield, and the LCD screen is mounted on a breadboard and connected to the Arduino via hookup wire. 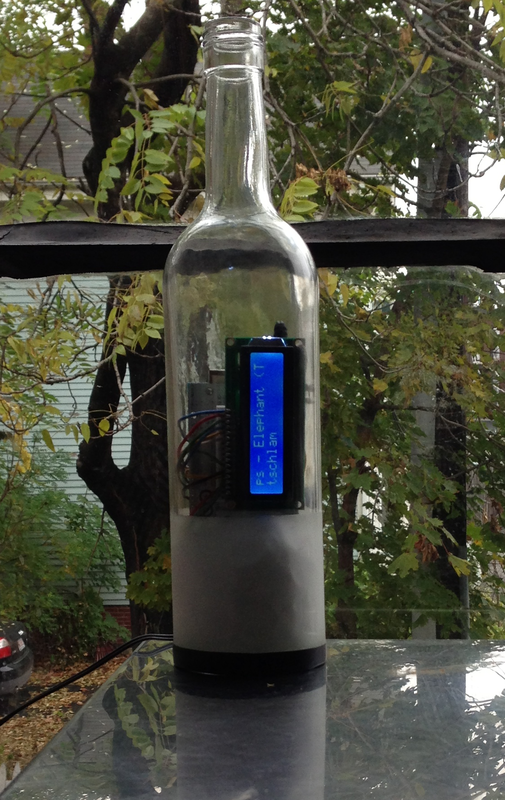 The tradeoff is bulk, though fortunately the electronics stack was just barely able to fit into the bottle. The stacked design trades off aesthetic appeal for flexibility in replacing and cannibalizing parts. The LEDs would live in the base, and act as as quick feedback. Each is 5mm, 1500+mcd brightness, sandpapered down for a more diffuse glow. When a new song starts, the white LED glows, then dims. 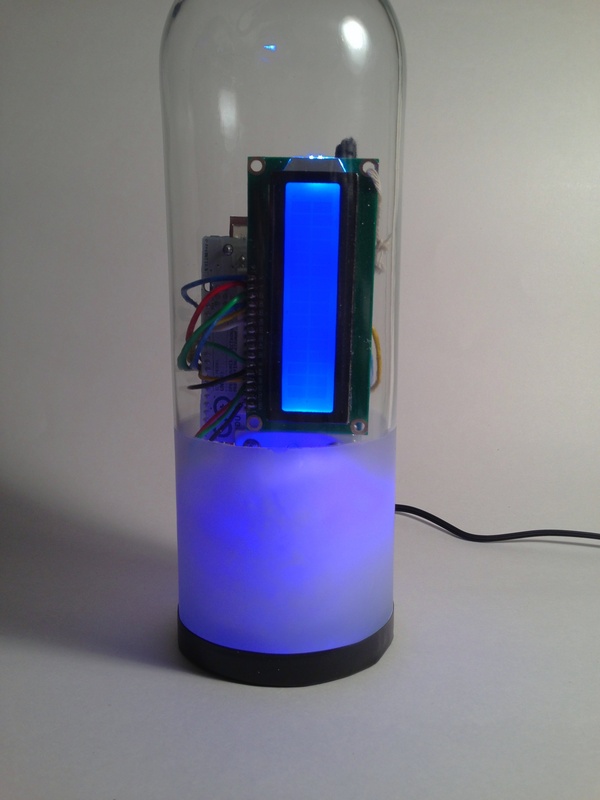 When the user “jams” a song, the blue LED glows, then dims. Finally, I removed the bottom of a wine bottle and mounted the stack inside. My initial plan was to actually use a real Prosecco bottle as the button. Unfortunately, the dark green glassed made the LCD screen difficult to read. Instead, borrowing from a Copenhagen Institute of Interaction Design project, the final button is in a clear wine glass, with a frosted base to further diffuse the light from the LEDs. The bottle seen from behind. The bottle in the kitchen, as The Flaming Lips’ cover of “Elephant” plays on Prosecco. Incidentally, this was my first solo hardware hack since college. Although hardware is much more accessible than it was back then, hardware hacks are still punishing when you make a mistake. Mixing up VSS and VDD bricked an Arduino before I’d even realized what happened, and unfortunately there’s no git for hardware. Thanks to @nedjl for building Prosecco, and for adding new capabilities — like the ability to jam via API — pretty much instantaneously. This entry was posted in hacks, hardware, music. Bookmark the permalink.